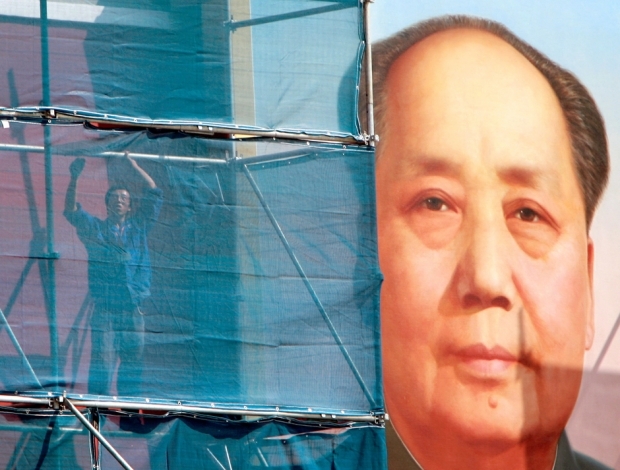 A man works behind construction netting beside the portrait of Mao Zedong at Tiananmen in 2007. Ma Licheng (马立诚) is a former Senior Editorials Editor at People’s Daily, the Communist Party’s most important mouthpiece, and the author of eleven books. In 2003, when Japan’s then-Prime Minister Junichiro Koizumi’s visits to the Yasukuni Shrine inflamed China’s anti-Japan sentiment, Ma published an essay in the magazine Strategy and Management entitled “New Thinking on Relations with Japan.” In it, he argued China should transcend its historical hatred of its neighbor. The essay sparked intense debate. Ma’s admirers praised his courage and capacity to reason; his critics denounced him as a traitor. In his 2012 book Eight Ideological Currents in Contemporary China, Ma explores the contending schools of political and moral thought that vie for dominance among scholars, political leaders, and the public. ChinaFile: During the anti-Japan protests in 2012, what surprised me was how many protestors expressed their nostalgia for Mao Zedong’s combative foreign policy. Until then, Maoism was usually discussed in relation to domestic issues rather than foreign affairs. What has changed? Ma Licheng: This is a recent change in China’s ideological landscape: Maoism and populism are converging. One reason for this is Bo Xilai’s political maneuvering in Chongqing, which greatly resuscitated Maoism. Bo exploited populism to further his personal ambitions, but in doing so he played a significant role in integrating Maoism and populism nationwide. In the past two or three years, China’s increasing inequality, rampant corruption, and environmental problems have triggered serious discontent among people at the bottom rung of the social hierarchy, whose interests have been hardest hit by these problems. They look to history for answers, and what they find is the Cultural Revolution. I’ve spoken with these people. They regard the Cultural Revolution as a simple and effective solution to these problems. But, they ignore the Cultural Revolution’s hugely destructive effect on China. The Communist Party’s top leaders have articulated their opposition to Bo’s “Chongqing Model” and the political drama has ended. Will Maoism now subside? I would say it has stalled. But the Maoists are not convinced. Many of them are trying to rehabilitate Bo Xilai, claiming that he was wronged. The populism and Maoism Bo represented still loom large in China. Bo may have fallen from power, but the negative influences of his policies remain. Will other politicians learn from Bo Xilai and attempt to wield Maoism and populism to gain political leverage? We can’t preclude this possibility, because the idea of Cultural Revolution-style solutions to China’s current problems, to some degree, appeals to people at the bottom rung of society. What is your assessment of nationalism in China today? China’s nationalism has complex origins. One root is China’s rapid economic development and the resulting wealth—and arrogance—that accompanies it. We are rich enough to buy up all the stores in New York. We are a luxury goods great power. This is the blind arrogance of the nouveau riche. The second root relates to China’s experience of being bullied by Western powers throughout modern history, which has resulted in a kind of revenge mentality. In addition, China’s patriotic education, ideological distance from other countries, and conflicts with neighboring and developed countries have contributed to the rise of nationalism. But things are changing. Based on my observation on Weibo of last year’s anti-Japan protests, many people are becoming more rational. Netizens were critical of law-breaking by the protesters and advocated punishing those who engaged in illegal and violent acts. Moreover, while I was branded a “traitor” over the last ten years because of my proposals in “New Thinking on Relations with Japan,” around sixty percent of people now support me. This reflects a big shift from the past. So, I feel that rational thought is making progress in China. Why is rational thought making progress? First of all, more and more Chinese are gaining access to education. Especially among youth, the percentage of people with a college education has greatly increased. As a result, people’s ability to distinguish right from wrong has improved. The percentage of college graduates in developed countries is around forty to fifty percent. In Mao’s China, this figure was around seven percent, but is approaching twenty percent today. I think China’s younger generation will be more rational as education levels improve, because rational thinking and education are proportional. Second, globalization is inescapable today. As a result, extreme nationalism would cause a country to become isolated from the world. People understand this. This will keep China more open and help offset nationalist tendencies to some degree. What is the government’s attitude toward nationalism? Nationalism can be a source of legitimacy for the government, so the government does indeed use it. But it can be a double-edged sword. When the government is not willing to declare war on foreigners, the nationalists label the government a traitor. This poses a dilemma: on the one hand, nationalism can be used by the government to bolster its legitimacy, but on the other, stoking nationalism risks undermining its opening up policies, aggravating relations with other countries, and, in the end, isolating China. Before the Tiananmen Crackdown in 1989, democracy and liberty were values shared widely among Chinese people. Why has this consensus disappeared? Political reform stalled. For many people, their only option was to pursue business. This situation can be found throughout Chinese history: when political pressure was formidable, people had to limit their discussions to safe topics such as romance, literature, and money. Additionally, for many people, their views on reform in China have changed. They feel it is too difficult to change China; they have given up their pursuit of liberty and democracy. But, I think there is a general trend toward democracy and constitutionalism. This may not be attainable just yet, and the process is full of ups and downs. It takes a very long time. We must be patient and not rush. Otherwise, reform will fail. Your outlook sounds optimistic to me. Does it refer to Chinese society’s attitude or the government’s attitude? Both. In terms of Chinese society, just take a look at Weibo. It’s clear people want freedom of expression. A foreigner with little knowledge of China might think China was already a democracy from reading Weibo. But China is not. Official attitudes are shifting as well. For example, the Guangzhou municipal government loosened control of registration for civil society groups last year. Political groups are still an exception, but athletic, business and professional, charitable, and cultural organizations are now able to operate without having to register under the auspices of an official government body “supervisor.” And the central government is promoting Guangzhou’s experiment. Also, there has been progress in social security reform, including health care, the pension system, and housing. Of course, social and political reforms collide with various interest groups. The game is very complex, which is why I think it will be a very long process full of ups and downs. What are the attitudes of the new top leaders? I think they are still on Deng Xiaoping’s trajectory, which is to say, economic growth is the top priority. But there is a new spotlight on efforts to improve people’s livelihoods. These are two different concepts, because if you fail to translate economic achievement into the improvement of people’s lives, you face a lot of problems. Constitutionalism and democracy are inevitable, though the leaders have not yet said as much. You may have noticed that the government has stressed rule of law recently. I think that rule of law should be China’s foremost goal in the short and middle-term and it should be realized earlier than democracy. Singapore offers an example of democracy following rule of law. China may learn something from this example. China’s Communist Party has often promised to construct a highly democratic country. Now it sets the deadline for the year 2049. In any case, it is progress that the Party no longer labels democracy as a negative concept. Some people overseas have lost patience. But generally speaking, I am cautiously optimistic. Which ideological current poses the most severe threat to China? Maoism. Maoism has a big market in China. Ordinary people are not immune to the manipulation of Maoism because they are the ones suffering the most.